Register here for the workshop to be held Saturday March 2, 2019. 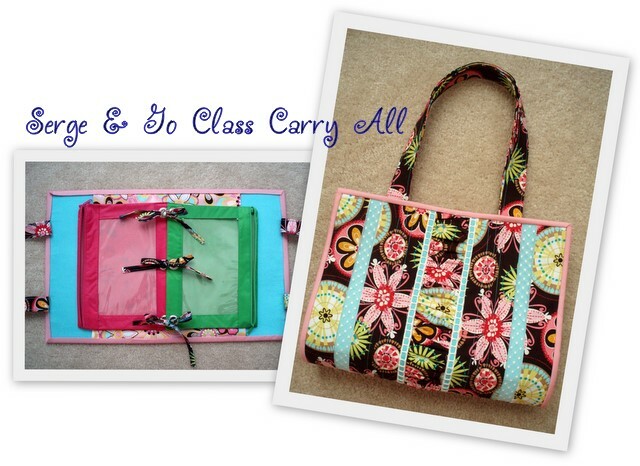 The online workshop will feature the Serge and Go Class Carry All, a Missy Billingsley project. The class will feature serging techniques including rolled hem, overlock, chain and coverstitch along with sewing machine options if you do not have a serger or don't have one that does a coverstitch. All techniques will be shown on a Baby Lock serger but this can be made with just about any brand serger as long as you know how to set your machine. With the paid workshop, you will receive written and video instructions for the Serge and Go Class Carry All. The workshop is in a closed facebook group March 2, 2019 Class with Missy B and once paid, you will be added to the group. You can then have access to the workshop videos and all class content to watch or review as many times as you like. Before being added you need to either send me a friend request or click the link above to join. If your facebook name and real name are different, please make a note in the comments or when you request to join the class group. The workshop videos are filmed with facebook live so there is interaction from students that attended the live workshops and the videos will always be available to watch again. The workshop is in a closed facebook group September 29, 2018 Class time and once paid, you will be added to the group. You can then have access to the workshop videos and all class content to watch or review as many times as you like. Before being added you need to either send me a friend request or click the link above to join. If your facebook name and real name are different, please make a note in the comments or when you request to join the class group. Register here for the workshop held Saturday July 7, 2018. The online workshop features 3 - 2 ish hour classes including an embroidery project for a 6.25x10.25 or larger embroidery hoop, a serger project and a Destiny IQ Designer created project(Notebook cover). All designs available in the workshop are in pes format. With the paid workshop, you receive instructions for all 3 projects plus the embroidery designs to accompany the embroidery projects. The workshop is in a closed facebook group July 7, 2018 Class time with Missy B and once paid, you will be added to the group. You can then have access to the workshop videos and all class content to watch or review as many times as you like. Before being added you need to either send me a friend request or click the link above to join. If your facebook name and real name are different, please make a note in the comments or when you request to join the class group.